Glaucoma – the "Silent Thief"
Glaucoma is a leading cause of blindness and vision impairment affecting approximately 2.5 million Americans. An irreversible and progressive optic nerve disease, glaucoma is marked by elevated pressure inside the eye and gradual loss of vision. The clear liquid that normally fills the chambers of the eye is called aqueous humor. It passes through the pupil and drains through a special membrane called the trabecular meshwork. In open-angle glaucoma, the flow of this fluid becomes impaired, much like a sink that cannot drain, leading to increased pressure in the eye. Too much abnormal pressure damages the optic nerve, which can eventually lead to blindness. Unlike conventional glaucoma surgery such as trabeculectomy or implantation of an artificial tube, Trabectome works to help the body help itself. Designed to improve fluid drainage from the eye through the natural drainage pathway and balance intraocular pressure (IOP), this minimally invasive procedure can help to stabilize optic nerve health and minimize further visual field damage by lowering eye pressure. Trabectome gently unblocks the pressure, then the area is washed to eliminate debris – leaving the eye to recover very quickly. The surgery is performed through a small incision and does not require leaving permanent artificial implants in the eye or creation of holes. Dr Lama was the first eye surgeon in New Jersey to perform the Trabectome procedure. Glaucoma specialists, like Dr. Lama have used the Trabectome procedure across the United States on hundreds of patients without severe or debilitating side effects noted. The Trabectome procedure is a three-step process that takes approximately 30 minutes. Incision – a tiny incision is made across the chamber of the affected eye. Electro-surgical pulse –diseased tissue is removed with an electrosurgical pulse. 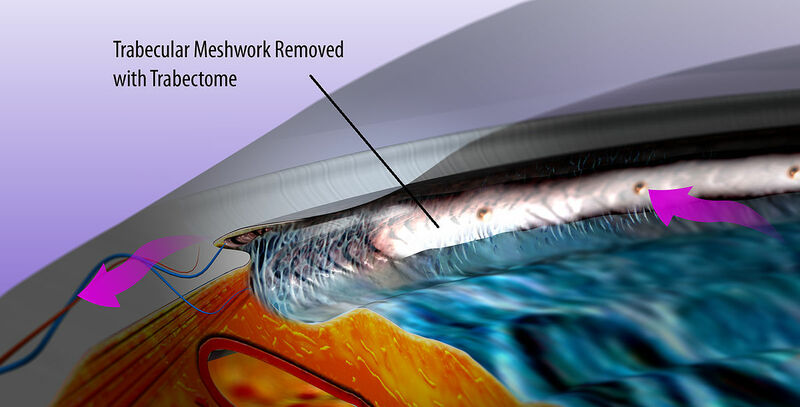 Washout – the eye is washed out with saline to remove tissue debris. If you are taking glaucoma medications, the drops need to be instilled in the eye up to and including the morning of glaucoma surgery. Patients who are taking glaucoma pills (diamox/acetazolamide or neptazane/methazolamide), unless instructed otherwise should take the morning dose with a small sip of water. Recovery back to pre-operative vision may take several days to allow clearing of the small amount of bleeding that normally occurs during the operation. Your eye will be patched for a few hours after the surgery. The general risks of this surgery are similar to other eye surgeries. They include mild discomfort from a stitch in the cornea, possible additional bleeding inside the eye with delay in vision return, and a very small risk of infection or loss of vision. Your ophthalmologist will discuss remedies for any discomfort you may experience. What kind of post-operative check ups will be necessary? Normally, your ophthalmologist will examine you at day 1, then 7 days, and 14 days after surgery. Your eye health will be monitored at regular intervals, up to a year from the date of your Trabectome procedure.